With the numerous giveaways from chains like Taco Bell, Chick-fil-A, Krispy Kreme, and of course, Chipotle, over the last 10 months, it's easy to feel like 2016 in indisputably the year of free food deals. 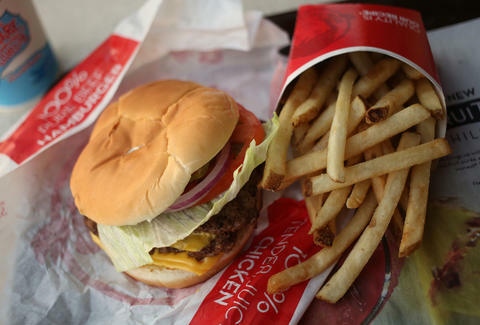 Thankfully, the free feeding frenzy shows no signs of slowing, now that Wendy's announced it's giving away a year's worth of free cheeseburgers to one person every day from now through November 20th. As part of a new campaign highlighting its decidedly square-shaped "never-frozen beef," the pigtailed fast food chain wants you to post photos or videos of the oldest item in your freezer on social media. All you have to do is post the images on Twitter or Instagram with the tags #FreezerDig and #Sweepstakes and you'll be entered to win the daily prize of free cheeseburgers for a year, or more specifically, a $520 Wendy's gift card. Photos that show other brand names or logos, however, will be disqualified, according to the official rules and a press release. Not to mention, you'll have to be OK with sharing/admitting to your 3-year-old collection of frozen chicken patties. Yikes. In any case, good luck excavating those rock-solid bags of frozen vegetables and Reese's Peanut Butter cups petrified in spilled water from your ice cube tray. Tony Merevick is Cities News Editor at Thrillist and hasn't had a Wendy's cheeseburger in a long time. Send news tips to news@thrillist.com and follow him on Twitter @tonymerevick.